Southern Thailand runs from just south of Bangkok down to the border with Malaysia. Home to some of the Kingdoms major tourist resorts, the locality caters for all tastes and interests, from rock climbing in Krabi, kayaking in Phuket or just lazing in a hammock on a beach. The weather has two distinct characters. The climate in south west is different from the south east as each is affected by different monsoons which means wherever you are there will be good weather somewhere. The islands in the south are very popular with Koh Tao, Phuket, Ko Pha Ngan and Koh Samui being the most well known. However, don't be fooled into thinking this quartet is all there is. There are dozens of islands to choose from, most with accommodation and all accessible by ferry. With a third of all tourists visiting Phuket at one point in their stay, it's by far the most popular island. However it is expensive and the more budget minded opt instead for the more backpacker friendly islands off the coast of Ao Nang. Krabi, Satun and Trang. But southern Thailand is not just about islands. Many ignore the mainland in their rush to get to a tropical beach. Some of the Kingdoms most spectacular views and scenery are found in the Railay Beach area on the west coast and nearby Krabi, famous for its limestone karsyts which attracts many climbers. Further up the coast is Khao Lak, virtually destroyed by the tsunami, is now rebuilt and attracting visitors again, in big numbers. Popular with families are the towns of Cha Am and Hua Hin which attract mainly European tourists, expats and Bangkok based Thais. 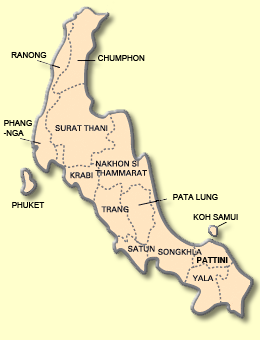 Heading further south are the provinces of Phattalung and Nakhon Si Thammarat. These rarely visited regions are ideal for those looking for the real Thai way of life. Further south are the cities of Yala, Pattani, Hat Yai and Narathiwat but these are in areas of heightened security and it is best to get the latest advice from your Foreign office before visiting.